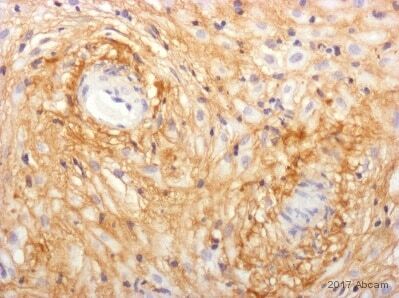 IHC: Human skin sections. WB: recombinant collagen III. Type III collagen, [a1(III)]3 ,is an approx. 300 kDa molecule, found predominantly in skin, blood vessels, liver, placenta, tongue, and thymus. Collagen type III forms cofibrils with type I and/or V collagens in a number of tissues of mesenchymal origin, such as skin, tendon, ligaments, and bone. This collagen type is involved, directly or indirectly in several genetic diseases, including Ehlers-Danlos type IV disease. Our Abpromise guarantee covers the use of ab6310 in the following tested applications. Western blot - Anti-Collagen III antibody [FH-7A] (ab6310)Image courtesy of Michaela Leyh by Abreview. Staining of formalin-fixed, paraffin-embedded rat skin with 1:4,000 ab6310 using biotin/ExtrAvidin®-Peroxidase. ab6310 at 1/600 diltuion staining preovulatory follicle and whole ovary tissue sections by Immunohistochemistry (Formalin/PFA-fixed paraffin-embedded sections). Antigens were retrieved by boiling with an antigen unmasking solution for 20 min at 120ºC in an autoclave and then cooled down in water for 5 minutes. The tissue sections were formaldehyde fixed and incubated with the antibody for 1 hour. An alkaline phosphatase conjugated antibody was used as the secondary. The image shows a section of whole preovulatory follicle. Staining for collagen type III is seen in the theca interna cell layer. 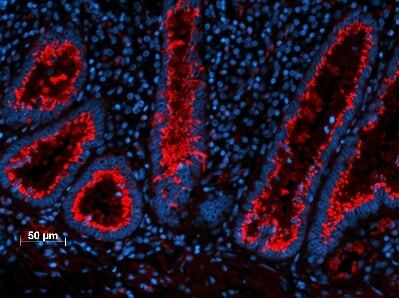 No staining in the granulosa cells. Staining of frozen rat skin sections with 1:8,000 ab6310 using biotin/ExtrAvidin®-Peroxidase. Publishing research using ab6310? Please let us know so that we can cite the reference in this datasheet. Thank you for your detailed answer about the anti-collagen III antibody ab6310. That's a pity indeed that the validity on pig was initially a mistake but these things happen. I am a regular customer who appreciate very much your policy about customer feedback and reviewing, and I'll submit an abreview about IHC-Fr in pig skin after performing the few more tests discussed. - From what I've read and optimized so far on frozen sections with different kind of antibodies, the antigen retrieval step is usually not needed as the fixation time is very short. I don't have any pronase, and I'm not sure it's worth for me buying some only for a test, with no insurance the antibody will work. I can try fixing in acetone instead or formalin see if it changes something. 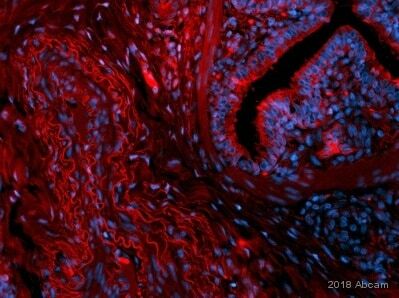 - The secondary antibody works well, I've written reviews about ab90395 (collagen I) and ab6328 (fibronectin EDA), where I used the same anti-mouse Cy2 secondary antibody on similar pig skin frozen sections with good results. - I have performed the procedure on a couple of separate samples, and I did it twice on independent batches before contacting the technical service, to ensure the problem was from the antibody and not from my experimental procedure. I’d like to try the reference ab23445, as I also would like to do some western blotting. If this second one doesn't work, will I still be eligible to try the other one, or for a refund? Thank you foryour understanding and cooperation. The details provided enable us to closely monitor the quality of our products. I hope the suggestions may proove useful with ab6310. It may be worth trying citrate antigen retreival with the PFA fixationif you have the reagents. It is unusual to use antigen retreival with IHC-Fr, however laboratory tests do indicate that this can sometimes improve the results. I am sorry this product did not perform as stated on the datasheet and for the inconvenience this has caused. As requested, I have issuedthe alternativefree of charge replacement of ab23445with the order number 1132685. Please note that this free of charge replacement vial is also covered by our Abpromise guarantee. 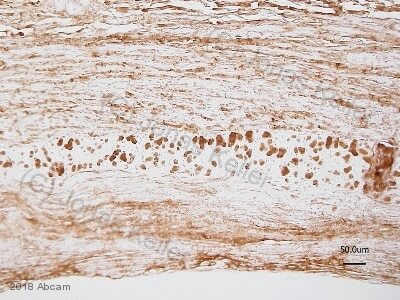 The ab23445 is tested and covered by the guarantee for IHC-Fr, WB and pig samples. Should you still be experiencing difficulties, or if you have any further questions, please do not hesitate to let us know. 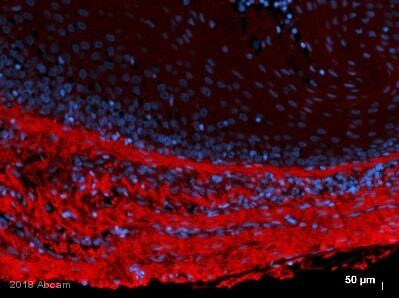 I have purchased the anti-collagen III antibody ab6310 a few months ago (order #1076197). Results: No positive staining was observed in the dermis, either in unwounded skin or in the wound bed (where there should be even more Collagen III). Another of your anti-col III antibodies ab7778 displays a strong positive staining in human dermis in IHC-P, that’s the kind of signal I was expected. Could you tell me the experimental conditions you have been using to validate it in IHC-Fr (I was surprised to read a line about some antigen retrieval with pronase, which is usually not necessary with frozen sections, but maybe that’s needed here. However nothing is precised on the first page, in the applications section. Would you have specific technical advices to help me make it work? Also, in your scientific support section about this antibody, I have just read that this antibody wasn’t actually experimentally validated on pig samples but only predicted to work, based on sequence similarity. I wish I had seen it before so I could have at least asked for the testing offer while purchasing it. Have you got any feedback of these customers who were working on pig tissue, did they manage to make it work? I also saw that you offered them to try other antibodies references that may work on pig, have you got more data on these other antibodies? Thank you for taking the time to contact us with this information. I am sorry to hear you have had difficulty obtaining satisfactory results from this antibody. I have investigated our records for ab6310 and have contacted our source for this antibody. Regrettably,I can confirm that this antibody has not been tested on pig. I am not sure why this information was originally on our datasheet. The datasheet has been updated with the correct information and I sincerely apologize for any confusion. The quality of our antibodies and datasheets is very important to us, as is any feedback and data we receive. It is regrettable that the information we had on this particular antibody was not of the standard both we and our customers expect from our products. In this case I would be pleased to provide you with an immediatecredit note, free alternative replacement or refund. 1. As requested, we have some information regarding the antigen retreival: ab6310 is only tested on unfixed frozen sections in-house, and the antigen retrieval method is 0.1% pronase for 10 minutes. However we also have feedback from other researchers using this antibody successfully in IHC on FFPE tissue, and heat-mediated antigen retrieval for 20 minutes in pH 6 citrate buffer should work as well. 2. We recommend not to mix blocking agents in one experiment. Try using 2% serum or 2% BSA alone to block. 3. Is the current vial of secondary antibody working well with other primary antibodies? 4. Try some fresh samples. https://www.abcam.com/index.html?datasheet=24119 (or use the following: https://www.abcam.com/index.html?datasheet=24119). https://www.abcam.com/index.html?datasheet=23445 (or use the following: https://www.abcam.com/index.html?datasheet=23445). Should the suggestions not improve the results, please do not hesitate to contact me again with details of how you would like to proceed. Unserem Wissen nach wurde ab7778 bisher noch nicht inSchwein und Schafund ab6310 nicht in Schaf getestet. Falls Sie dies selbst testen möchten, kann ich Ihnen zurzeit ein spezielles Angebot über einen 100%igen Abreview-Rabatt anbieten. Bei diesem Angebot bekommen Sie einen Rabatt für eine zukünftige Bestellung, wenn Sie uns ein Abreview mit dem Testresultat zusenden. Der Rabatt würde den ganzen Wert des Antikörpers abdecken, und gegen eine erneute Bestellung von uns verrechnet werden. 1.) Bestätigen Sie mir bitte,welchen Antikörper Sietesten möchten. 4.) Testen Sie den Antikörper in Schaf (und/ oder Schwein). 6.) Der Rabattcode ist nach dem Abschicken des Abreviews aktiv, und Sie können einihn mit einer neuen Bestellung verrechnen lassen (halten Sie bei der Bestellung bitte den Rabattcode). Bitte beachten Sie, dass der Rabattcode innerhalb von 4 Monaten nach Ausstellung eingelöst werden muss.